Clifford Ross’s Hurricane LXVIII pairs well with Winslow Homer’s Weatherbeaten. Although the Portland Museum of Art is well known for its extensive collection of classical landscapes and portraits, including those by Andrew Wyeth and Winslow Homer, the institution also exhibits contemporary works that continue the traditions set by the old guard and enhance the meaning of the archetypal images. Visitors can also reserve the Peggy L. Osher Art Study and Collection Committee Conference Room to view pieces from the museum’s collection that are not currently on display. 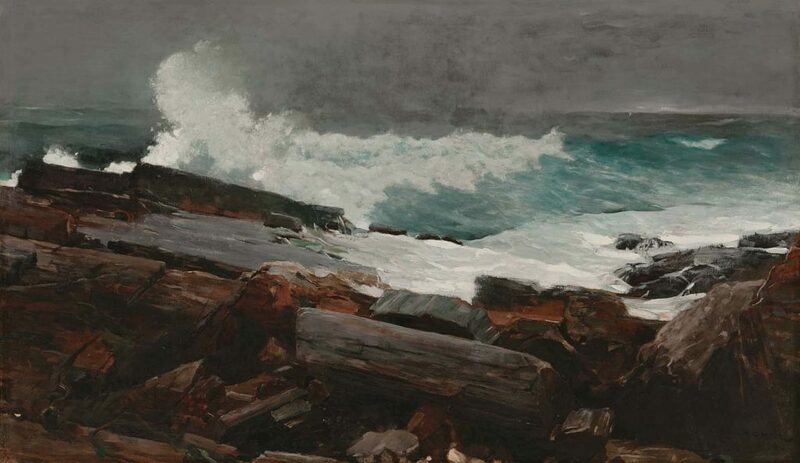 Homer’s Weatherbeaten communicates a familiar Maine coastal scene: a rocky shoreline battered by blue-green waves. Although other works may express water symbolism as inherently comfortable, Weatherbeaten transforms the potential beauty of a seaside landscape into a tense, problematic experience. American photographer Clifford Ross similarly seeks a taut elegance in his images that, mirroring Homer, verges on eruption. Ironically, the two works suggest the subtlety of immense sentiments, like anguish, that can haunt the mind. Donated by David Rockefeller, River Cove shows a jetty near the artist’s home in Cushing. Fine details such as clamshells and the ephemeral traces of a bird’s talons embody the egg tempera with a sense of place, while the murky water captures the reflection of surrounding pine trees. Understood in relationship to River Cove, the soft, tangent curves of Kelly’s strong shapes in Yellow Over Black refer to the feeling a landscape can offer; while Wyeth transmits loneliness through detail, Kelly creates emotion through precise simplicity. From October 6 to December 31, the Portland Museum of Art showcases photographer Nan Goldin’s work in a career- encompassing exhibition, Nan Goldin: Family History. In The Sisters, Boston, the intimate, sideways glance of the woman on the right goes unnoticed by her sister who looks directly into the camera, representing a palpable—and perhaps one-sided— expression of emotional dependency. Shot 30 years later, Jocelyn Lee’s Untitled (Kara’s First Pregnancy) conveys the complexity of incumbent motherhood, which strips away the possibility of independence and separation between the self and another person. 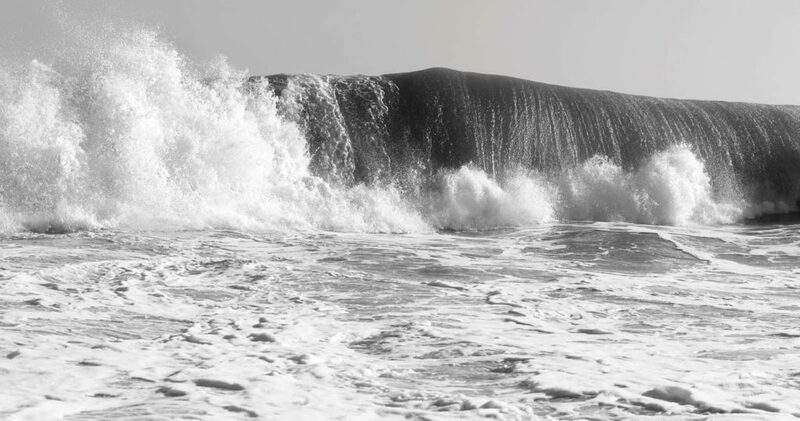 Clifford Ross (United States, born 1952), Hurricane LXVIII, 2009, inkjet print, 48 x 82 inches. Museum purchase with support from the Irving B. Ellis Fund, the Photography Fund, the Contemporary Art Fund, and the Harold P. and Mildred A. Nelson Art, Purchase Endowment Fund, 2016.9. ©Clifford Ross Studio, All rights reserved. Winslow Homer (United States, 1836–1910), Weatherbeaten, 1894, oil on canvas, 28 1/2 x 48 3/8 inches. Bequest of Charles Shipman Payson, 1988.55.1.